After the launch of the new Mini 3- and 5-door in India, the M3 sedan and M4 coupe from BMW will be hitting showrooms on November 27. Apart from the slightly modified nomenclature, the highlight in the cars would be the new engine running them. The twin-turbo 3.0-litre six-cylinder turbocharged engine puts out 431PS, which is marginally more than the V8 motor it replaces. Torque produced from this engine is 550Nm which is sent to the rear wheels via a seven-speed dual clutch transmission. Despite the electronically limited top speed for both the cars being 250kmph, BMW claims a sub 5-second o-100kmph time. While the M3 gets two additional doors and the M4 sits lower owing to the sloping roofline, both the cars are the same when it comes to dynamics. They also come with optional Brembo carbon ceramic brakes. Compared to the outgoing cars, both the M3 and M4 are now 25 per cent more fuel efficient as well as prone to lower CO2 emissions, in spite of increased power and torque figures. Expect both the cars to cost over a crore on-road. Keep watching this space for more. 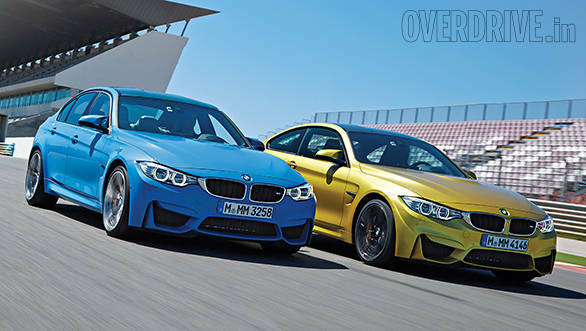 We've driven the new BMW M3 sedan and M4 coupe. Read all about it here.